Biodynamic farming is based on the agricultural philosophies of Rudolf Steiner, father of anthroposophy and Waldorf-Steiner education. While biodynamic farming includes organic farm management practices, i.e., not utilizing synthetic pesticides and fertilizers, it also uses specially prepared, natural treatments, incorporating natural rhythms and cycles of the moon and sun, light and warmth. See the Biodynamic Farming and Gardening Association Website for more detailed information about biodynamic agriculture. As with the Denominacion de Origin in Spain, France has the Appellation d’origine contrôlée (AOC), a French certification granted to wines and other agricultural products. In Faye D’Anjou in the Pays de la Loire region of France you can find close to fifteen acres planted with vines of Chenin Blanc grapes tended organically and biodynamically at Domaine de Juchepie. 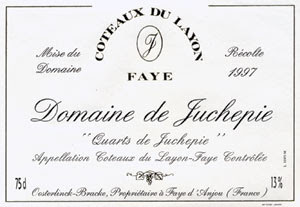 The vineyard was created in 1986 and is recognized under the Appellation Coteaux du Layon-Faye. The vines are forty years old on average with the oldest dating from 1911. Organic since 1994, harvesting is done by hand, and the wine is fermented without adding sugar or yeast. They make mostly sweet wines, with the exception of "J" The Sec Juchepie Appellation Anjou dry, made from 100% Chenin Blanc. Their Quarter Juchepie, Churelles, and Quintessence are sweet wines. The Passion is a dessert wine. They do not enter their wines into competitions. The wines are available in Belgium, Germany, Netherlands where there is a good demand for biodynamic products. Otherwise the only way to buy them is to go to the vineyard, but call or email first to make an appointment. Domaine de Juchepie, Les Quarts, 49380 Faye D’Anjou; Tel: 02 4154 3347; Email: contact@juchepie.com; Web: www.juchepie.com. See the Green Earth Guides~Traveling Naturally post about a vegetarian bed & breakfast and other sites an hour or so from this vineyard.